Throughout the nation, hundreds of historic movie houses have closed, overwhelmed by the rise of television, shifting demographics, and suburban multiplexes. Through World War II, movie going was the most common form of popular entertainment with people attending two or three times a week. In 1946, the peak of the movie industry’s attendance figures, 90 million people a week attended the movies. 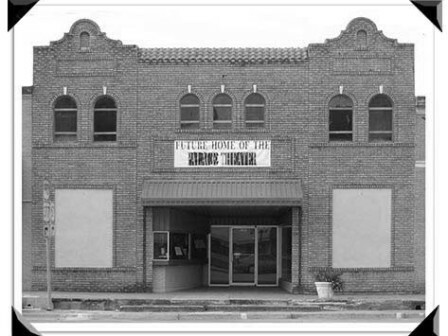 Theaters were a community meeting place, an entertainment mecca for cities and towns that valued movies in a public place, vaudeville shows, recitals and informational presentations. Most of them were located in the center of the town square and were landmarks in the community. Many were architectural gems–ornate buildings constructed in a variety of exotic and opulent styles, including Moorish, Art Deco, Egyptian, Mayan and Oriental. Historic theaters deserve an encore as part of Main Street developments that are revitalizing small towns and it is important that they are protected and restored instead of demolished. This statewide trend is represented by Palace Theater, Brady, McCulloch County. The Brady Palace Theater, built in 1927, is vacant and suffers from years of neglect after having been occupied by and remodeled for a variety of retail businesses. The theater has decorative elements, glorious glimpses of its past, and needs to be restored to its former beauty and usefulness.